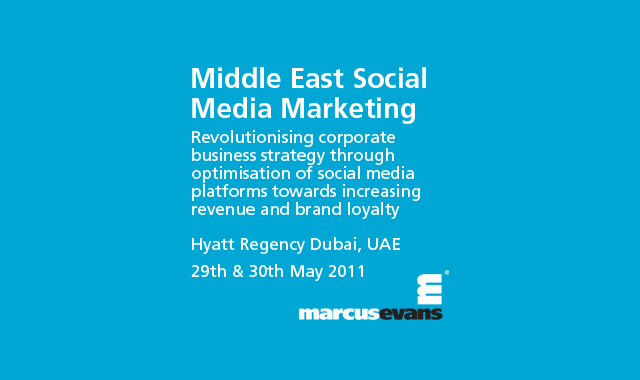 This article is sponsored by the marcusevans Middle East Social Media Marketing conference that will take place on the 29th & 30th of May in Dubai. We will be writing more articles in this format leading up to the conference where we will ask the expert speakers of the conference different questions related to social media and in the MENA region. Our first expert is Racha Mourtada. Racha Mourtada is a Research Associate with the Governance and Innovation Program at the Dubai School of Government. She has worked with the team that published the The Arab Social Media Report that highlights and analyzes usage trends of specific networking tools across the Arab region. Q1) How do you currently see the role of social media in the government sector? Usher in a new era of digital policy-making by providing citizens with the tools engage and participate in relevant issues, through applications such as wikis, online forums and social networking tools. Foster inclusiveness and engage citizens in government processes, taking governance to a whole new level of ‘e-participation’. Q2) Do you think governments should be utilizing social media networks more? Governments should be using social media as they see fit. Social media should be integrated into their current ICT and e-government strategy, but there is no ‘one-size-fits-all’ solution. The benefits of social media will vary depending on the level of ICT maturity within each country (factors such as Internet penetration, mobile penetration, and how ICT-savvy citizens are). So for governments whose ICT maturity level is quite low, it might be too soon to introduce social media. However, for governments that are more mature and have an ICT-savvy citizen base, social media could help move them towards a more efficient, collaborative and inclusive e-government model. Q3) Do you think that governments are now looking onto social media networks differently after the events that happened in the region? I think governments are looking at social media differently, and this can be primarily divided into two camps. Some governments may perceive social media’s capacity to be used for rallying and organizing people as a threat and impose restrictions on the use of social media tools. Others may take advantage of social media’s ability to connect disparate groups of people and use these tools to engage with citizens and involve them in government processes. Q4) Which do you think would be the most suitable social platform for a government to be active on? And how do you suggest they deal with issues that might pop up? Again, there is no single solution or platform or tool that can be recommended, as the specificities of the chosen tool depend on the requirement of the government agency and their particular needs. A government-owned and developed social media tool might, for some agencies, be best when it comes to internal collaboration between various departments. However, for engaging with citizens it might be more suitable to for governments to develop an online presence on an existing popular social media website that their constituents already use. We would like to thank Racha for her answers as well marcusevans for helping out. If you’d like to see Racha present at The Middle East Social Media Marketing Conference you can get in touch with the organizers and request more information here. Social media penetration in government still a risky option for the most of the Arab states. we can't make sure that public employees wouldn't leak sensitive information about the government systems, and/or data might lead to information leakage. Can you ask any government employee to read and fully understand the privacy statement of facebook for example? Information once leaked to public it is very hard to withdraw, thus, after a thorough study and consideration we at the electronic government research center recommend the Arab governments to start an awareness program and try to strike the balance between potential benefits from social networks and information security (social engineering in particular).